Collect and index notes, addresses, contacts, research notations, and more with Personal Knowbase. 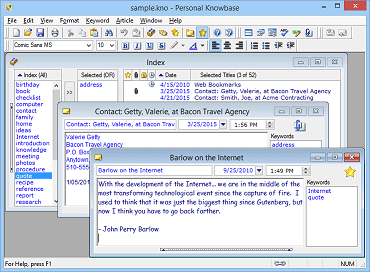 Personal Knowbase is a freeform note card organizer for Windows. Create a digital index card system to store your information. By assigning keywords to each note (card), you create an index that groups related notes for quick access. Save time not rifling through stacks of paper index cards. Sort by title or date. Cross-reference your "index cards" with hypertext links. Put each card in as many "card stacks" as you need by assigning it multiple keywords. Store a large number of notes. No limits on number or length of card content. With Personal Knowbase, you can be an information packrat. This software helps you keep your note-taking organized and avoid information overload. To create a virtual "stack" of index cards, assign the same keyword to all related notes (cards). Select that keyword to see the titles of all cards in that "stack". Since you can assign any number of keywords to each note, each card can belong to any number of stacks. Unlike with paper-based index cards, with Personal Knowbase you can place a note in multiple "stacks", make notes of any length, and re-sort instantly. "Restack" notes on the fly by recombining keywords with combinations of AND, OR, and NOT. If you need to directly cross-reference two cards, you can create a hypertext link from the text in one card to the other card. Whether you can use Personal Knowbase to print to physical index cards depends on your printer settings. You need to change your "paper size" (in your Printer's "Properties") to the size of the index card and set its orientation to "landscape mode". Some printer drivers have trouble supporting small paper sizes. You may need to adjust the print margins using Personal Knowbase's Page Setup feature. For example, setting a wide right margin forces all text to the left on the page. Using this method, you could print to a wider card stock & cut the paper size smaller for index cards. Get Personal Knowbase Note Card Organizer Software Today!